I was totally in love with Guatemalan worry dolls when I was a kid, it didn’t hurt that they were tiny (and I think many young girls have a fascination with miniature things) but I also appreciated the legend that went along with them. The idea is that when you’re worrying too much to be able to sleep, you tell your worries to the doll and then put it under your pillow. The doll then continues to worry for you so you don’t have to, so you can go to sleep. At this point, parents can pull a little Tooth-Fairy move and remove the dolls if they wish to simulate the disappearance of the worry, but I only had two or three of these at a time so I always held on to them. In addition to Bipolar disorder, I was also recently diagnosed with Generalized Anxiety Disorder. I’ve had issues with anxiety since childhood, and at that point every little bit helped. I don’t think I was aware of the therapeutic properties of worry dolls as a kid, just that they were small and colorful and fun. It has been a long time since I’ve seen any of these dolls, but I still follow the same idea when I am having trouble sleeping because of anxiety. I write the worries in a journal, and somehow that makes it so I don’t have to worry them anymore. I’ve been thinking about these little guys for a while now, but in the last few days my anxiety has really started escalating again which brought the idea to the forefront of my mind. I’ve also recently been noticing how I’ve been using skills I learned as a child in my adult life, swapping out my playdough for pasta dough and my legos for Ikea bookshelves. It might have something to do with my close friends beginning to have children, kids are a total enigma to me so I’ve been having trouble wrapping my head around the idea of it all. Anyway, increased anxiety the last few days, compounded intensely by the bizarre bipolar episodes I’ve been having. Mania beyond what is usual for me, bursts of hypomania, and then yesterday this nagging, dragging feeling. Despite the hypomania, I’m experiencing what feels like a dashed-line of depression as well, which must be the dreaded (yet elusive) third state: mixed. I told my therapist that mixed states are like the Voldemort of bipolar episodes. Elusive, but carrying all the evil of both depression and mania in one fell swoop. Voldemort is doing a jig in the corner of my peripheral vision and my anxiety is spiking because I can’t seem to shake him. I’m planning on keeping calm and relaxing today, he should dissipate on his own. I hope so. He’s got that pale, awkward bumpy forehead and gives me the creeps. This entry was posted in Bipolar, Mixed and tagged anxiety, Bipolar, Depression, hypomania, Mania, mental illness, mixed state. Bookmark the permalink. wow, i had never heard of those little dolls before, what a great idea ! It’s a surprisingly sophisticated idea for children, don’t you think? I ate it up as a kid though. A very useful alternative to the tooth fairy! 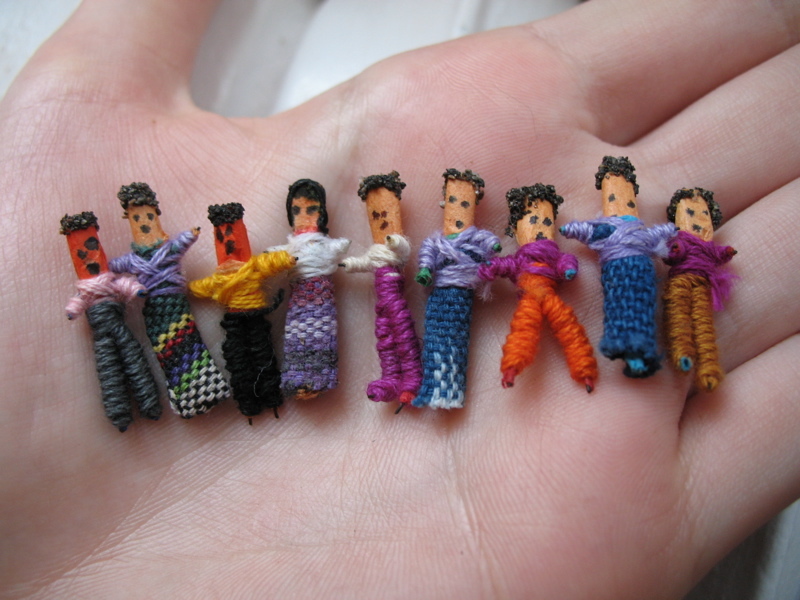 I had worry dolls as a kid, I loved them so much. I think I’m going to have to go and hunt some out for myself now. I’m sure you can probably find them on the internet but I’m a total sucker for scouring the local area for something like this. Good luck on your hunt! I have been meaning to reply to this for days! First, you reminded me of my own long forgotten worry dolls! I wish I still had them. I loved them! The concept of a worry doll is brilliant. And, I would love to make my own. Perhaps, this is a project I could get C.S in on. You are incredibly lucky to have healthy coping skills, and especially ones you developed in childhood. During my first round of therapy, that was one of the therapeutic goals; learn functional coping skills. Apparently, it didn’t stick. The only thing from childhood that took any root was “choose your battles” and “time out”. I like time outs. It gives me time to calm down and digest all of the input. I had to learn things as an adult. It’s hard to teach and old dog new tricks. I was actually thinking lately about making worry dolls as well, and though I appreciate the little tiny ones I almost feel inclined to make a regular doll-sized voo-doo-ish version of myself. Kind of an… adult worry doll, but the same concept. That and I have a crazy huge urge to make earrings using the original tiny dolls. I’ve always had a very sponge-like brain, I tend to soak up every bit of information thrown at me. On one hand, this quality makes me very easy to take advantage of (because whatever you tell me I’ll soak up immediately) but on the other it has allowed me to continue learning as if I was a child, as well as fall back on those childhood lessons. Sponge-Sarah Square-Brain or some such thing. That said, I still went through many unhealthy coping skills too (self-harm, for example) but actions like that one aren’t quite as… embraced by the medical community, so I dumped most of them. I really hate when people wag their finger at me. The real sized version sounds appealing. But, I worry (ha! A pun!) That it would take away the appeal of the dolls. For me, it was like the dolls lived in a different world, where everyone cared. They absorbed my worry and took it away to their world where it could be made into peace and returned to me another night. I liked it. A charm bracelet would be cool for the little worry dolls, though. Except, I’ve always had this thing about dolls and stuffed toys. They were real to me. They had feelings and could hurt. They needed love and a home. I had to care for them. Who else could give them the love they needed? And I hoped that they could give me the love I needed in return. Truthfully, they did. I still have my best friend of my childhood. Her name is Furry. She’s a well-loved, thread-bare, purple bunny. And she has been there, even silently watching over me, for almost all of my life, even now. Creepy? I don’t care. But, that’s my security blanket.